Hector, Terrence and Dee are sitting around the cafeteria speculating about the life of their cafeteria lady. Dee thinks that she might have hundreds of cats. Science geek Hector thinks that maybe she's a super secret-agent spy. The three friends would be astonished if they knew that the lunch lady is actually a superhero - and she has some suspicions about the new substitute teacher. The math teacher who is absent has not been sick once in the past twenty years, for one thing - and the new sub is completely uninterested in her fresh-baked cookies. With the aid of her trusty, gadget-inventing cafeteria assistant Betty, the lunch lady embarks on some heavy-duty investigation. What a fun start to a new graphic novel series! The story is funny, clever and creative - particularly the lunch lady's culinary-related gadgets, and the bold, expressive illustrations are a perfect fit to the humor and excitement. As a fellow gadget lover, I could not help but be impressed by her fish-stick nunchucks, her spatula helicopter, and her chicken-nugget bombs. 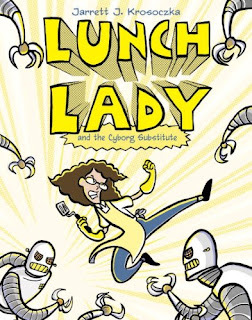 Add to the mix a gleefully evil, monomaniacal teacher, an army of spooky claw-handed robots, and a trio of elementary school kids tailing their lunch lady, and readers are in for a silly, action-packed romp. Fans of Babymouse and Ricky Ricotta are going to gobble these books right up. Becky's Book Reviews: "...I liked this one. It had a fun premise." Carrie's YA Bookshelf: "It took me about 15 minutes to read this book and I loved every minute of it....The action jumps of the page and hooks you from page one." Mother Reader: "With a variety of silly, food-themed gadgets and a large serving of humor, readers will leave wanting second helpings." Welcome to My Tweendom: "...a laugh-out-loud funny graphic novel that is sure to have kids talking. From the familiar school angst that Hector, Terrence and Dee are facing, to the wise cracking maintenance man, readers will recognize their own lives." How fun! I just put this one and the Librarian one on hold at my local library. Wendy - Great! I hope you enjoy them as much as my kids and I did. You know I saw the first book in the Once Bitten series today at a used book store and I was thinking, "I bet Darla has reviewed this," sure enough came home and find you have. Do you think I would like this series? VA Gal - I don't know - it's like Mission Impossible meets a supernatural female James Bond - but funny, and while there is romance, it does take a while to blossom. Might not be your cup of tea.